Cute For St. Patrick's Day Parties! Mickey's Shamrock Shorts Recipe! Cute for St. Patrick’s Day Parties! Mickey’s Shamrock Shorts Recipe! It’s March, that means it’s time to find fun treats and activities for the next holiday, St Patrick’s Day! We usually find Disney goodies decked out in red, yellow, etc…. but for occasion, Mickey’s shorts have turned green! Easter is early this year, so be on the lookout for fabulous Spring and Easter goodies and activities. Until then, let’s get our Shamrock on! 1. 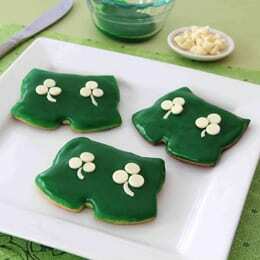 Print and cut out the Mickey’s Shamrock Shorts Cookies template. OR, make your own “shorts” cutouts! 2. Heat the oven. Working on a flour-dusted sheet of wax paper, roll out the chilled dough to Mickey short shapes from the dough. Bake the cookies according to the recipe directions and then let them cool completely. 3. Meanwhile, melt a small handful of white chocolate chips in the microwave according to the package directions. Spread the melted candy on wax paper and set it aside for a few minutes to harden. Once it’s ready, cut the candy into thin slivers to use for the shamrock stems, and set them aside for now.